You are traveling by subway or through an uncovered area from which you can not escape. After several minutes watching other travelers with their eyes on their cell phones, you will surely wonder how to spend the time that you are locked in there. Take a look at our selection of the best free games with offline mode for Android and you will find hours of fun, which in turn you can complement with our comparison with the best smartphones for games and where to find them at the best available price. Mobile device users have a growing gaming offer in the international market, but, according to a new trend, the sector wants to focus on access procedures that necessarily involve the use of the network, as has been the case seen with Pokémon GO and lately also with Super Mario Run, available for iOS and soon to reach Android. Precisely in order to make leisure an independent experience of internet, we want to show today some of the best free games with offline mode for Android, which anyone can enjoy without the direct need of an internet connection. Regarded by many as one of the best games for Android, Asphalt 8 is a classic racing game that is available for download directly from the Google Play app store. The user must download and install the product (preferably using WiFi). Once installed, you can enter airplane mode and play without the worry of all the problems that being offline use to give, due to lack of access to the network. In this case, the user can enjoy good graphics and adrenaline races aboard well-known car brands (among which McLaren is now also found). Does not Commute is a game less known than Asphalt 8, but equally rewarding from the point of view of entertainment. The game consists of completing really original missions in the middle of the traffic of a virtual city. The game provides an aerial view that ensures a clear and complete picture of the game situation and, therefore, a more intuitive interaction to complete the proposed levels and all related missions (similar to GTA 2). A really spectacular title that has in its favor the fact of being played in offline mode and the advantage of being completely free. If you like puzzles, Unblock Me is your game. Fun, free and fully functional offline. An ideal pastime to spend the dead hours and keep the mind occupied in the most boring moments of daily life. Dream League Soccer 2016, like all the proposals in this article, run without the need to have a network connection and introduces you into a soccer simulator where you can train and confront an ample amount of teams. All with some pretty respectable graphics that never impede to enjoy everything that the game offers. 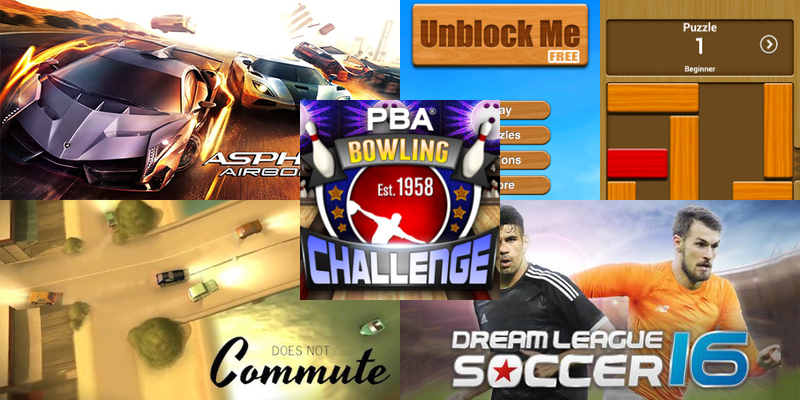 If you are looking for simpler or less time-consuming game, your choice is PBA Bowling Challenge, one of the best sports simulation games on Android. With pleasant graphics and an excellent level of realism, the user will completely forget about anything outside the screen of his smartphone. Its offline operation, also in this case, is guaranteed. These are, in our opinion, the best free games with offline mode for Android for 2016. However, Google Play Store offers a wide variety of games equally useful for our pretensions, including classics like Temple Run, Plague Inc. and a version of the ever-timeless Grand Theft Auto series, a direct legacy of the world of consoles (although many of us play it on our computers).